Running is generally my weakest leg of a triathlon. I could resign myself to the fact that, as indicated by Dr. David L. Costill, Ph.D., I had simply failed to “carefully select your parents”. However, I not only want to participate in triathlon but also compete in the sport. Therefore, I have read several books on running and am currently following a training program for running from a book that I will review in another article. Having been running continuously now for only five years, I am holding onto the fact that we will typically continue to improve for 7 to 10 years after starting running. Hal Higdon is a competitive runner and has been since he was in college at Carleton College in Northfield, MN, my home state. Despite the fact that he continued to run after college and even compete internationally at Masters (over 40 years) events, he was struck by the characteristic of 91-year-old Duncan MacClean who he described as ‘moving young’ despite his age. As Higdon wrote, cosmetic surgery and hair color can change our appearance, but unless we stay active, the first time we move, we will give away our age. Following his career through college and beyond, Higdon shares the results of academic research that in the late 1970’s documented what we now take for granted – that those who remain active, on average live longer. The more strenuous the activity, such as from running and the sports of triathlon, the greater the effect. Starting from the proof provided the studies by researchers Ralph S. Paffenberger, Jr., M.D. ; Kenneth H. Cooper, M.D. ; Michael L. Pollock, Ph.D.; Jack H. Wilmore, Ph.D.; and David L. Costill, Ph.D., Higdon shares ideas on how to become and continue running well into the senior years. While it is best if we never get out of shape, this news may be too late for some of us. So, we work with what we have and start now. If you want to start running, Higdon provides a simple plan that he calls ’30/30 Plan’ that involves a mix of walking and running for 30 minutes per day for 30 days. Once we have started running, we can adopt Higdon’s ideas about how to improve our running ability by gradually but consistently increasing the intensity (speed and distance) of running and by strength training. In fact, he makes a major case for strength training indicating that the number one goal for the book is to convince the reader to include regular strength training in our routines. 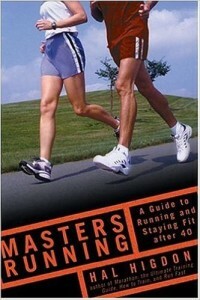 The book includes an entire chapter on how to create a personalized training program. Training smarter includes cross training, which of course fits the plans of a triathlete who must train in three sports. But he also identifies sports that support running, such as cross-country skiing and snowshoeing, as well as activities such as yoga stretching that provide the needed recovery. Learning to rest and how to rest – to prevent injury yet not risk losing the benefits of the previous smart training – is defined as well. Through examples and anecdotes from his nearly lifelong experience with running, Higdon not only makes points important to becoming a better runner but also illustrates why these are important, something our inquiring minds appreciate.